Nervous investors are looking for signs of stability in the Middle East and North Africa. The region’s burgeoning investment banking industry may provide the reassurance they’re looking for. 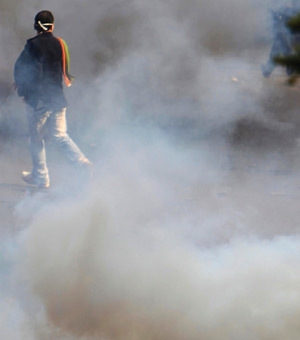 The political crisis in Egypt, Tunisia, Yemen, Bahrain, Libya and elsewhere in the Middle East and North Africa dominated the headlines for weeks in January and February, leaving an already fragile region looking more vulnerable and creating a major headache for global policymakers. From an economic perspective, the countries involved are relatively insignificant: In terms of GDP, Egypt is roughly as important to the global economy as a small Midwestern US state, for example. However, the Middle East is about far more than economics. Egypt—by far the most important of the countries undergoing upheaval—is home to the world’s largest Arab population and the world’s tenth-largest armed forces and is the US’s most important Arab ally. More important, the broader political and economic region—especially with oil hovering around $100 a barrel—is crucial to the continuing global economic recovery: Already there are fears that weak growth in some European countries, for example, could be snuffed out by higher fuel prices. “Continued concerns about unrest in the Middle East could provide an unsettling backdrop to global markets,” says Ann Wyman, contributing analyst at Nomura in London. “A broad reevaluation of domestic political stability in countries throughout the region—and even some beyond the region—is under way. In the commodity space, it has been global oil [prices] that have responded most to the increased uncertainty about regional instability, spiking higher. Gold markets were also marked higher, and if broader risk aversion continues, this trend may well continue,” she adds. Ali Khalil, chief operating officer at Kuwaiti asset manager and investment bank Markaz, says that “strong demand in much of the region, fueled by positive demographics,” should ensure a strong year regardless of the turbulent political backdrop. Instead there could simply be a reordering of priorities by the region’s governments. “The situation in Egypt and elsewhere will result in a shift by regional governments from capital investment to relief of unemployment and subsidies to reduce commodity prices,” Khalil says. 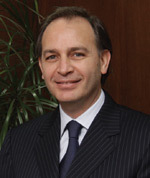 While such a shift will be problematic in cash-strapped Egypt, where subsidies are already close to 8% of GDP, according to Alexander Perjéssy, senior economist at investment firm AllianceBernstein, which has assets under management of $486 billion, they are unlikely to cause any significant problems in the Middle East’s richest markets, such as Saudi Arabia. Events in Tunisia, Egypt and Yemen have drawn the world’s attention to the Middle East, but it is important to remember that Egypt, by far the largest of the three, has an estimated 2010 GDP of around $216.8 billion (at the official exchange rate). That compares to $239.7 billion for the United Arab Emirates (UAE) and $434.4 billion for Saudi Arabia (which, more importantly, possesses about 20% of the world’s proven petroleum reserves and is the largest exporter of petroleum in the world). Overall, Gulf Cooperation Council countries have almost double the oil reserves of any other region in the world. In short, it is the six states of the GCC—Bahrain, Kuwait, Oman, Qatar, Saudi Arabia and the UAE—that drive the Middle East’s economy. 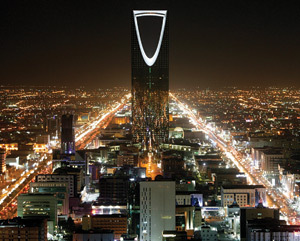 Researchers at Bank of America Merrill Lynch (BoAML) expect the GCC’s GDP to reach $1.07 trillion in 2011. "We expect a range of markets in the GCC to become more open and better regulated in 2011"
The economic outlook for much of the GCC looks supportive. BoAML research suggests Saudi Arabia will grow by 4% in 2011 while Qatar will register double-digit real GDP growth. Only the UAE stands out as a laggard. Credit growth is likely to pick up this year, led by Qatar and Saudi Arabia, while inflation will average 4.1% as recovery takes hold. For corporates, earnings are expected to grow strongly in 2011: For the GCC overall, Markaz’s Khalil expects 23% growth with Kuwait recording 32% growth and the remainder of the region an average of 20%. According to Thomson Reuters, investment banking fees in the Middle East—which in practice means the GCC—rose marginally by $2.5 million to $567.2 million in 2010 from 2009. Mergers and acquisitions were the mainstay of investment banking activity in the Middle East in 2010, generating almost half of all fees. During the year, more than 500 deals were announced in the region—an all-time record—while volumes, based on target nation, reached $31 billion, more than double the activity seen during 2009. Telecommunications was the most targeted industry in the Middle East, with $13.2 billion, while Kuwait was the most active Middle Eastern country, accounting for 46% of activity. Khalil also expects to see plenty of acquisitions of distressed assets and companies. “The GCC has lagged the rest of the world because of the difficulties of liquidating assets in many countries,” he says. “Bankruptcy laws in the region can make it difficult to obtain judgment against borrowers.” Khalil notes that 22 of 37 real estate companies in Kuwait are classed as distressed, while a number of investment companies have only recently finished restructuring. After M&A;, fees from debt capital markets operations (DCM) constitute the largest portion of investment banking fees in the Middle East. Figures from Thomson Reuters show that in 2010 almost a quarter of fees—$137.1 million—were derived from DCM despite issuance from the region falling 7% to $37.1 billion from 2009. Of the total, 60% of issuance was investment-grade corporate debt, with agency, sovereign and supranational issuance accounting for 35% of activity. In 2010 financial, energy and power and telecommunications were the most active sectors issuing debt. "It makes sense to … have one dominant Middle East and North Africa exchange"
The syndicated loan market, which accounted for 13% of investment banking fees in the Middle East in 2010, showed a similar profile to DCM, although volumes of $30.3 billion were an impressive 90% higher than the $15.9 billion of 2009. The most active industries for Middle Eastern loan issuance in 2010 were energy and power and financials. Beyhum says that the Islamic bond, or sukuk, markets could hold great promise in 2011, “especially in the GCC region, as sovereigns are expected to push sukuk issuance as part of fulfilling national budgets, and as financial institutions seek to diversify funding sources and strengthen their balance sheets.” He adds: “It is important to note that during 2010, the sukuk market lagged the conventional bond market, as the former was hit by the aftermath of Dubai’s debt restructuring and the accompanying series of defaults on high-profile sukuk issuances." Perhaps the greatest opportunity in the Middle East in the coming years is financing related to infrastructure development. In particular, Saudi Arabia and Qatar are engaged in massive government spending on housing and infrastructure. “We are optimistic about the Kingdom and see many opportunities in government issuance and infrastructure projects,” says Jawdat Al-Halabi, chief executive officer of NCB Capital, the investment banking arm of the National Commercial Bank, the largest in Saudi Arabia. Indeed, Beyhum at BankMed says that the opportunities in Saudi Arabia and Qatar are so vast that they alone herald a bright future for investment banking in the GCC region in the short to medium term. Beyhum expects that Saudi Arabia will return to solid growth this year, supported by public commitments for projects related to economic diversification and infrastructure development. “The $386 billion five-year (2010-2014) public investment program will accelerate private sector activity, especially in project finance, construction, and manufacturing,” he says. The scale of Saudi Arabia’s plans is impressive: The shortage of affordable housing coupled with the rapid rate of population growth has, for example, prompted the government to launch ambitious plans to build entire cities. Equity capital markets activity in the GCC was limited in 2010. “Low volumes and a lack of a sustained momentum on stock exchanges held back IPOs,” explains Al-Halabi at NCB Capital. Most observers are cautiously optimistic about primary market activity for 2011. However, there is ground for confidence in relation to a long-standing bugbear of international investors: the difficulty of gaining access to many Middle East stock markets. Change may be about to occur in the region’s largest market, Saudi Arabia, while markets could be strengthened in one of its most important financial centers, Dubai. Saudi Arabia’s Tadawul stock market is the largest and most liquid in the region but bars non-nationals from direct-share purchases. Since August 2008, foreign investors have been able to gain exposure to stocks (though not voting rights) using total return swaps. Volumes have increased, although in the first half of 2010 (the most recent period for which figures are available) they represented less than 1% of trading volume, and the vast majority of users were hedge funds rather than long-term investors. In January there were suggestions that foreign investors could soon be allowed to make direct stock purchases. A number of reports said that officials were meeting with 29 regional banks and brokerages to assess their capacity to manage foreign accounts. Should such a reform occur, it could be momentous for the Middle East, given the huge scale of Saudi Arabia’s stock market, economy and planned infrastructure spending (which could be partly funded through stock sales). Meanwhile, important events are also occurring in the self-proclaimed financial capital of the Middle East, Dubai, where most international investment banks have their regional headquarters. The dollar-denominated Nasdaq Dubai exchange, formerly called DIFX, has consistently disappointed since its launch in September 2005. On January 18, the exchange proposed changes to listing rules—including measures that could attract a wider range of businesses to list, including family businesses and SMEs—that could give the flagging bourse the boost it needs. “The main rationale behind the changes appears to be the desire by Nasdaq Dubai to create, attract and maintain liquidity in its market, building on the steps it made toward this goal post the merger with the Dubai Financial Market last year,” explains Emma Chee, a corporate finance lawyer at legal practice Norton Rose in Dubai. The merger with the Dirham-denominated DFM, which is retail-focused and much more liquid than Nasdaq Dubai, made Nasdaq Dubai’s stocks available to DFM investors—potentially increasing liquidity. The DFM itself announced on January 31 that it would introduce “delivery versus payment” settlement, which is used by most major exchanges, as part of its drive to implement international best practices. The move also meets a key requirement for a potential promotion of the UAE stock markets from Frontier Markets to Emerging Markets within the MSCI Emerging Markets Global Index. MSCI is expected to review the status of the UAE markets in June 2011. In the longer term, some market observers hope for stock exchange consolidation in order to boost liquidity. 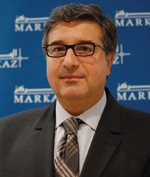 “As in the Western world, theoretically it makes sense to merge the individual exchanges and have one dominant Middle East and North Africa exchange to exploit liquidity across the entire region, operate under one legal and regulatory framework, increase volumes and help further attract foreign investor interest,” argues Shoman at Arab Bank. Given that such consolidation took many years in Europe—and was aided by political union and a single currency—such goals still seem remote. But while the unrest wracking the Middle East continues to increase, the outlook for the region’s economies remains positive and, if the prospects for the investment banking industry are a guide, economic development will continue apace. The investment banking market in the Middle East is expected to remain highly competitive. 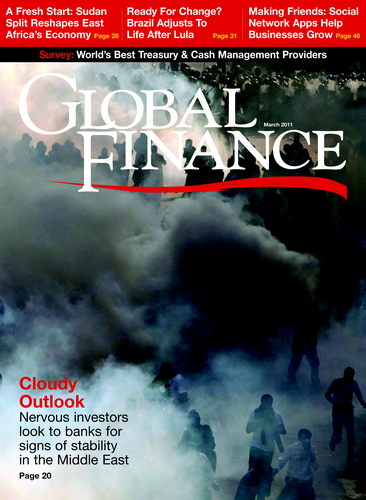 “The Gulf Cooperation Council market, especially the Saudi market, has been on the radar screen of the major global investment banks, which have aggressively entered the market by acquiring investment banking licenses from the relevant authorities,” says Mohamed Ali Beyhum, executive general manager at BankMed in Lebanon. Beyhum says that these players have entered an already competitive landscape dominated by the investment arms of major local commercial banks. “They have subsequently created fierce competition to secure qualified resources as well as lucrative business opportunities,” he says. Consequently, in 2011, Beyhum expects to see increased competition over large- ticket deals, downward pressure on investment banking fees, strong demand for skilled investment bankers and the strategic repositioning of local and international investment banks.